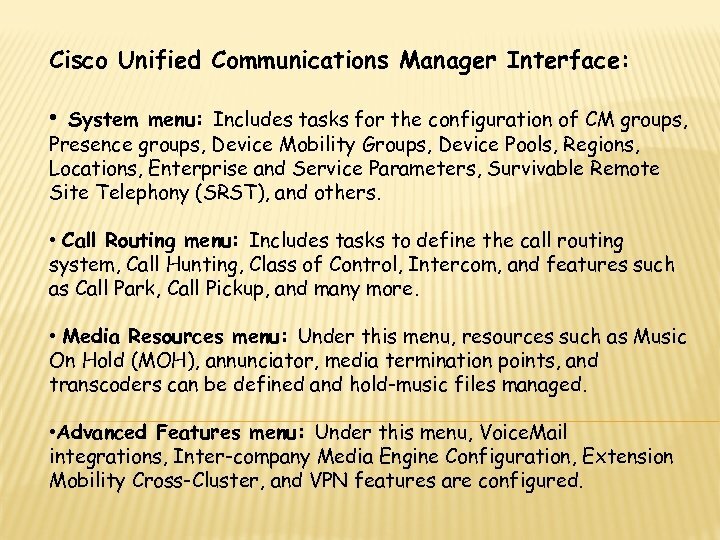 Cisco Unified Communications Manager Interface: • System menu: Includes tasks for the configuration of CM groups, Presence groups, Device Mobility Groups, Device Pools, Regions, Locations, Enterprise and Service Parameters, Survivable Remote Site Telephony (SRST), and others. • Call Routing menu: Includes tasks to define the call routing system, Call Hunting, Class of Control, Intercom, and features such as Call Park, Call Pickup, and many more. • Media Resources menu: Under this menu, resources such as Music On Hold (MOH), annunciator, media termination points, and transcoders can be defined and hold-music files managed. • Advanced Features menu: Under this menu, Voice. Mail integrations, Inter-company Media Engine Configuration, Extension Mobility Cross-Cluster, and VPN features are configured. 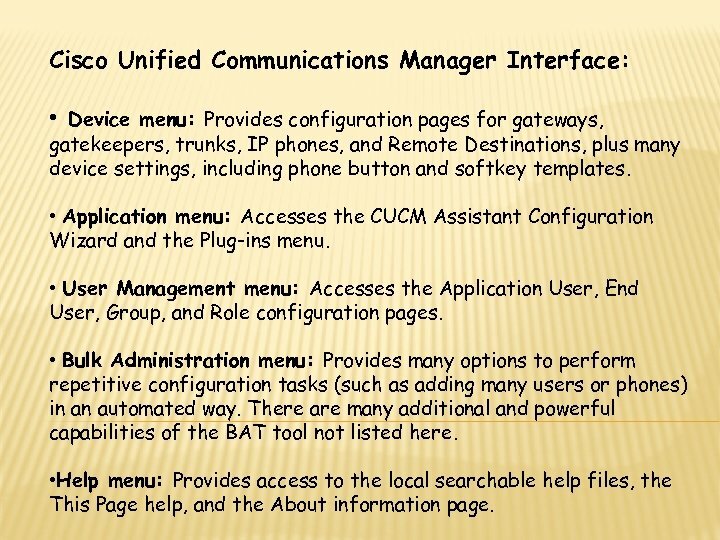 Cisco Unified Communications Manager Interface: • Device menu: Provides configuration pages for gateways, gatekeepers, trunks, IP phones, and Remote Destinations, plus many device settings, including phone button and softkey templates. 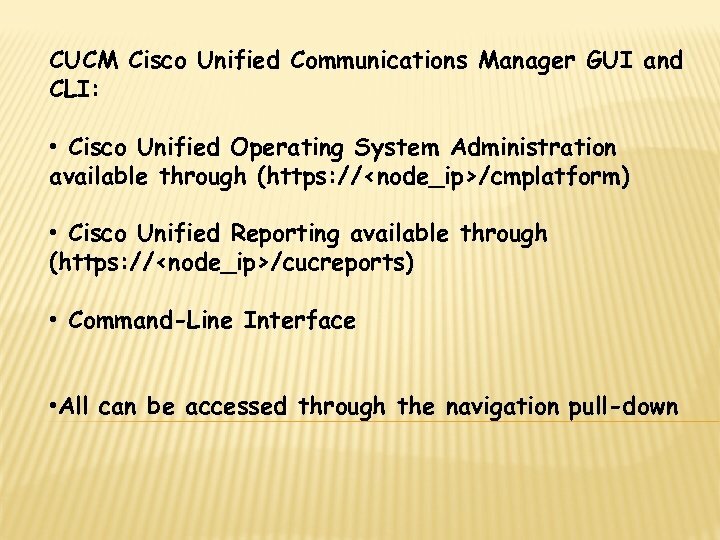 • Application menu: Accesses the CUCM Assistant Configuration Wizard and the Plug-ins menu. 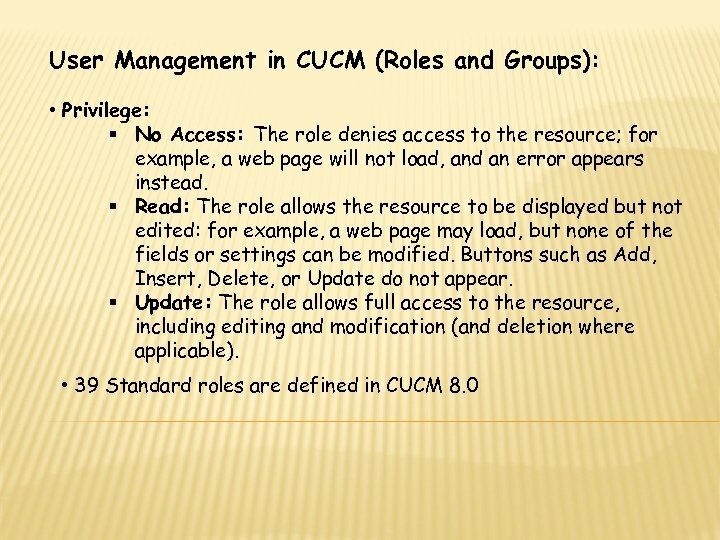 • User Management menu: Accesses the Application User, End User, Group, and Role configuration pages. • Bulk Administration menu: Provides many options to perform repetitive configuration tasks (such as adding many users or phones) in an automated way. There are many additional and powerful capabilities of the BAT tool not listed here. 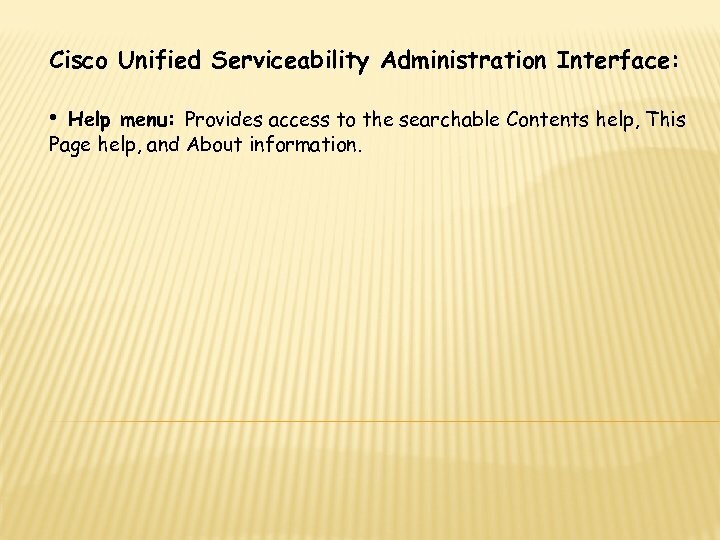 • Help menu: Provides access to the local searchable help files, the This Page help, and the About information page. 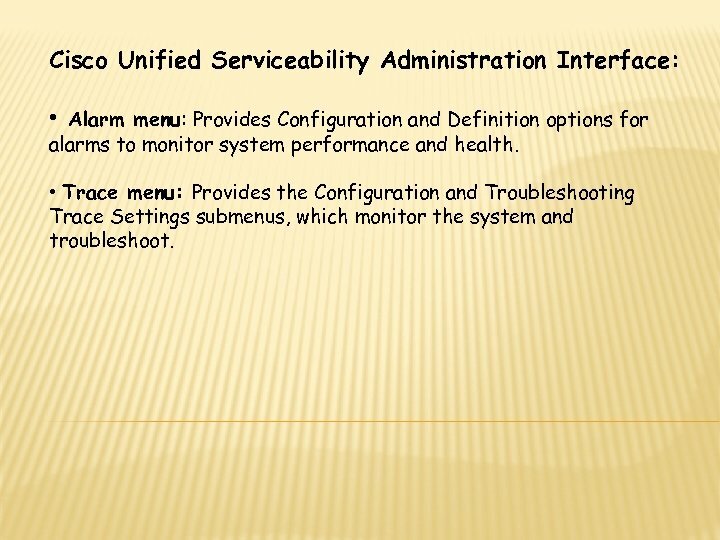 Cisco Unified Serviceability Administration Interface: • Alarm menu: Provides Configuration and Definition options for alarms to monitor system performance and health. • Trace menu: Provides the Configuration and Troubleshooting Trace Settings submenus, which monitor the system and troubleshoot. 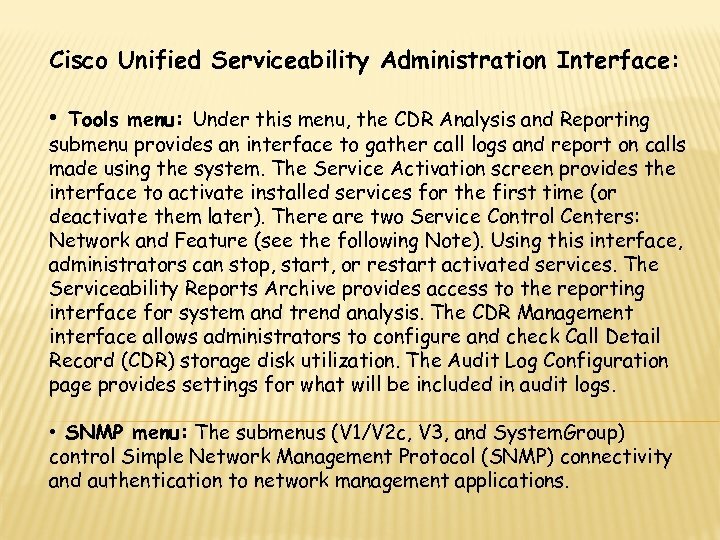 Cisco Unified Serviceability Administration Interface: • Tools menu: Under this menu, the CDR Analysis and Reporting submenu provides an interface to gather call logs and report on calls made using the system. The Service Activation screen provides the interface to activate installed services for the first time (or deactivate them later). There are two Service Control Centers: Network and Feature (see the following Note). 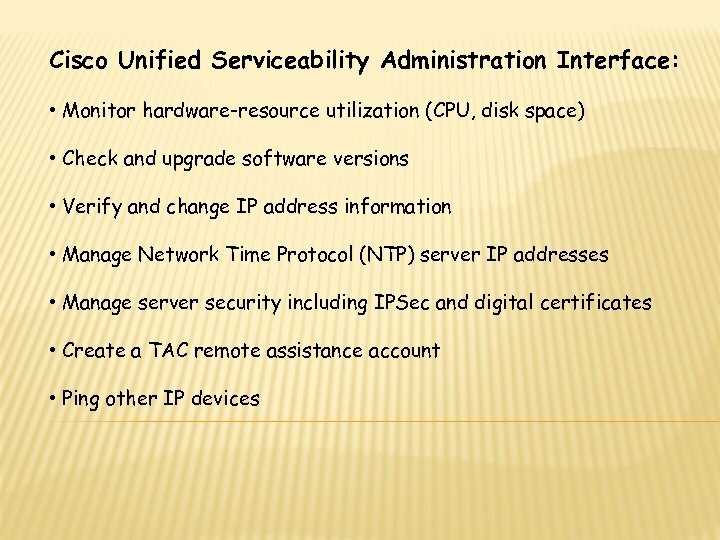 Using this interface, administrators can stop, start, or restart activated services. The Serviceability Reports Archive provides access to the reporting interface for system and trend analysis. The CDR Management interface allows administrators to configure and check Call Detail Record (CDR) storage disk utilization. The Audit Log Configuration page provides settings for what will be included in audit logs. • SNMP menu: The submenus (V 1/V 2 c, V 3, and System. Group) control Simple Network Management Protocol (SNMP) connectivity and authentication to network management applications. 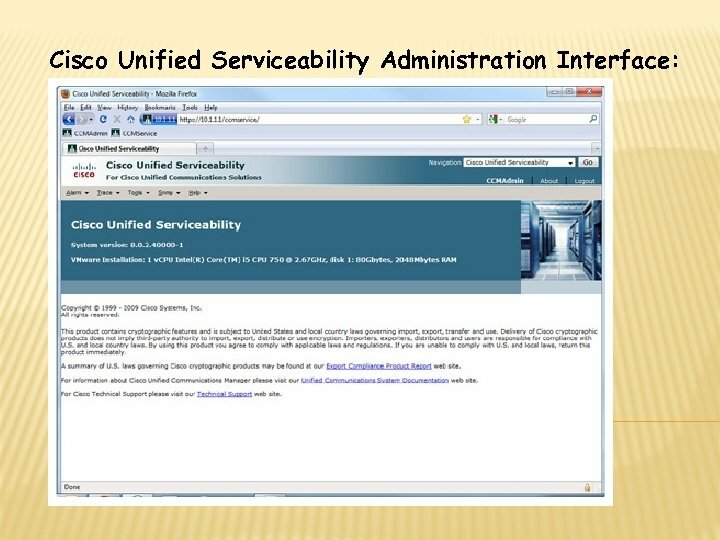 Cisco Unified Serviceability Administration Interface: • Help menu: Provides access to the searchable Contents help, This Page help, and About information. 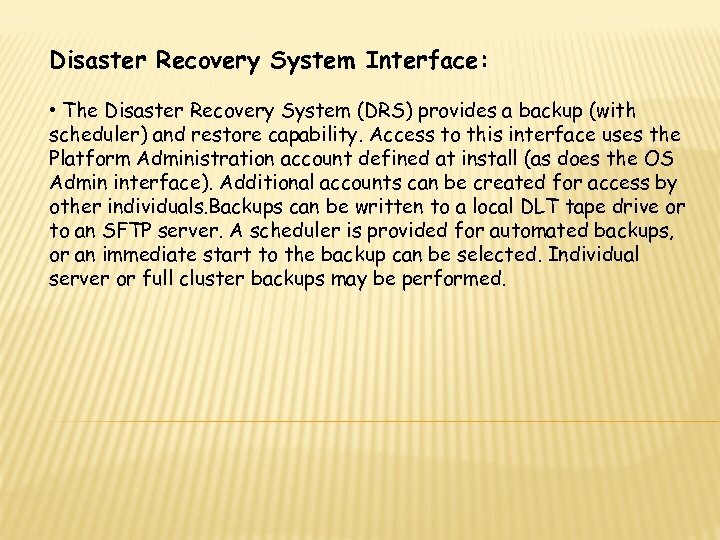 Disaster Recovery System Interface: • The Disaster Recovery System (DRS) provides a backup (with scheduler) and restore capability. 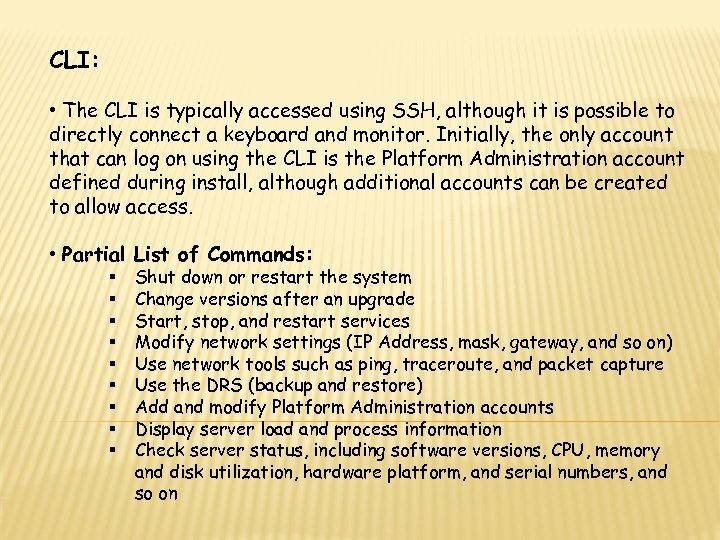 Access to this interface uses the Platform Administration account defined at install (as does the OS Admin interface). Additional accounts can be created for access by other individuals. Backups can be written to a local DLT tape drive or to an SFTP server. 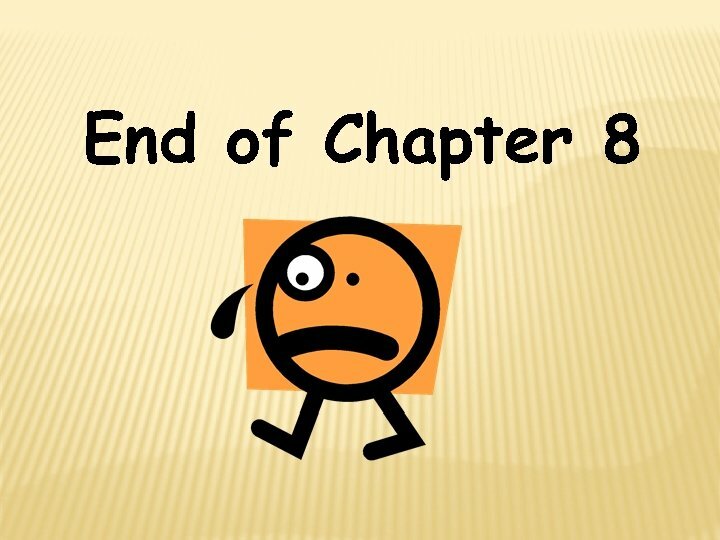 A scheduler is provided for automated backups, or an immediate start to the backup can be selected. Individual server or full cluster backups may be performed. 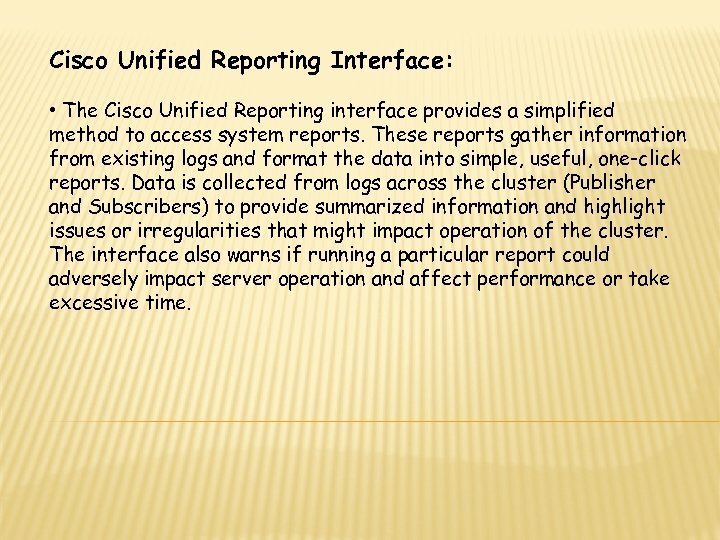 Cisco Unified Reporting Interface: • The Cisco Unified Reporting interface provides a simplified method to access system reports. These reports gather information from existing logs and format the data into simple, useful, one-click reports. Data is collected from logs across the cluster (Publisher and Subscribers) to provide summarized information and highlight issues or irregularities that might impact operation of the cluster. The interface also warns if running a particular report could adversely impact server operation and affect performance or take excessive time. 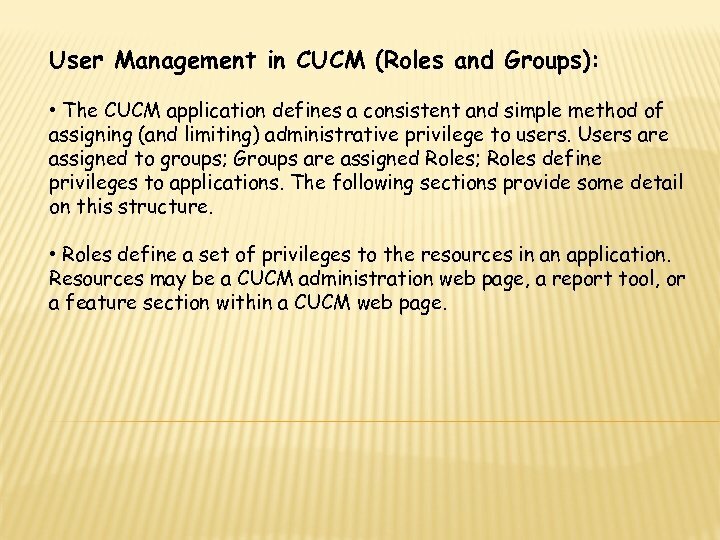 User Management in CUCM (Roles and Groups): • The CUCM application defines a consistent and simple method of assigning (and limiting) administrative privilege to users. Users are assigned to groups; Groups are assigned Roles; Roles define privileges to applications. The following sections provide some detail on this structure. • Roles define a set of privileges to the resources in an application. 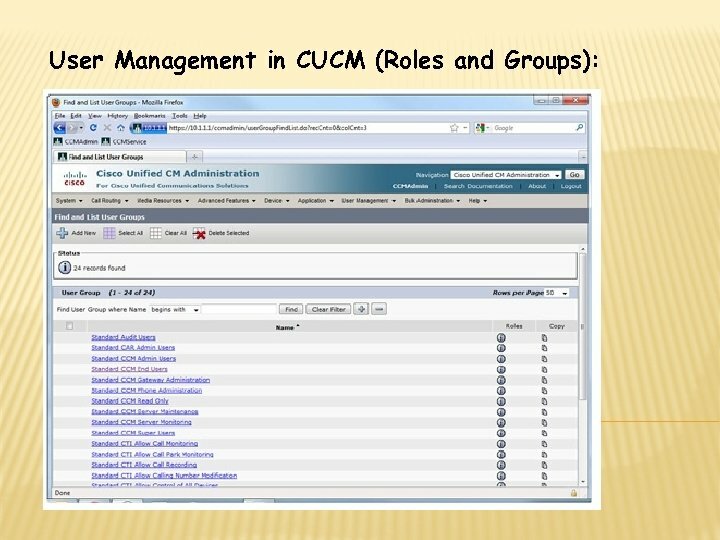 Resources may be a CUCM administration web page, a report tool, or a feature section within a CUCM web page. 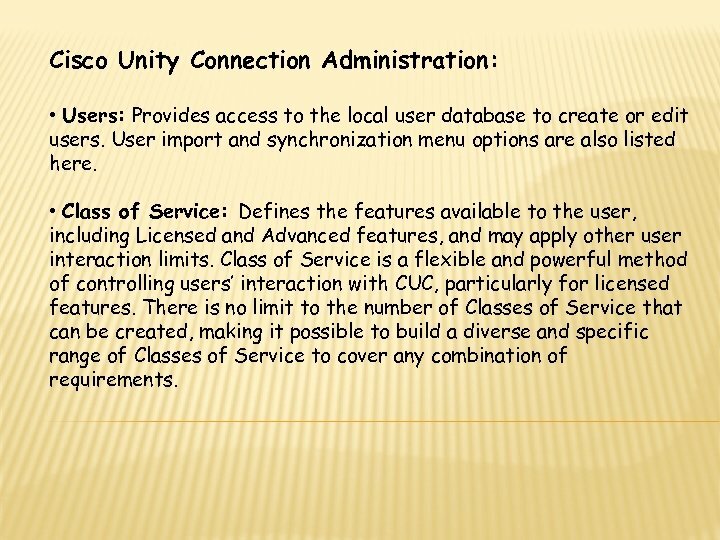 Cisco Unity Connection Administration: • Users: Provides access to the local user database to create or edit users. User import and synchronization menu options are also listed here. • Class of Service: Defines the features available to the user, including Licensed and Advanced features, and may apply other user interaction limits. Class of Service is a flexible and powerful method of controlling users’ interaction with CUC, particularly for licensed features. There is no limit to the number of Classes of Service that can be created, making it possible to build a diverse and specific range of Classes of Service to cover any combination of requirements. 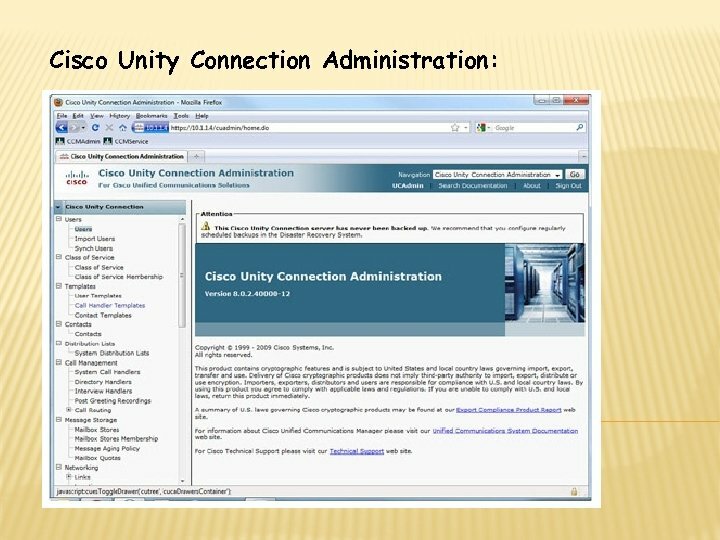 Cisco Unity Connection Administration: • Templates: Provide a way to define common settings for Users, Contacts, or Call Handlers. When creating a new one of these three types of object, selecting the appropriate template applies all but the individually specific information for each object, making the process faster and more accurate. 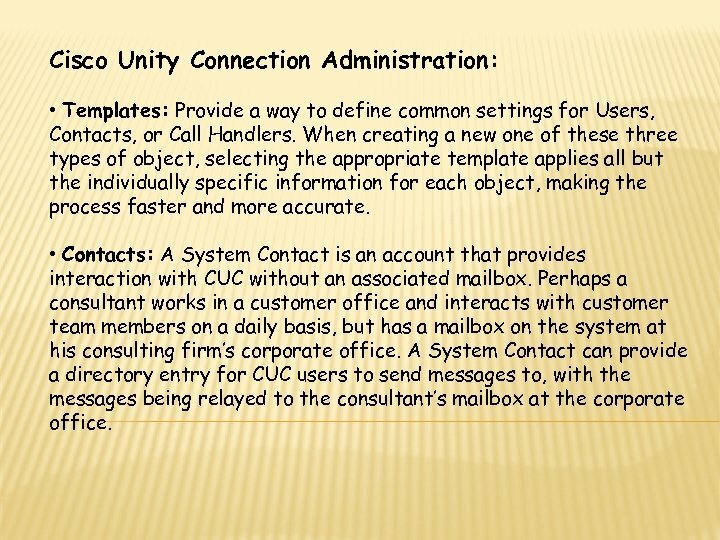 • Contacts: A System Contact is an account that provides interaction with CUC without an associated mailbox. Perhaps a consultant works in a customer office and interacts with customer team members on a daily basis, but has a mailbox on the system at his consulting firm’s corporate office. 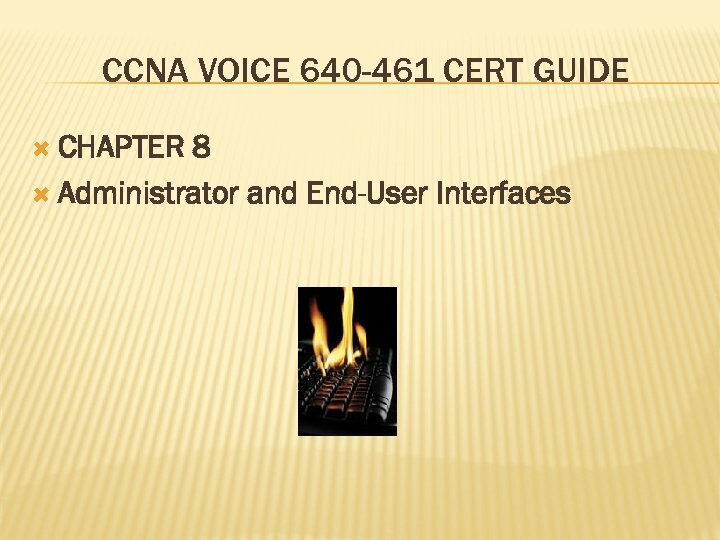 A System Contact can provide a directory entry for CUC users to send messages to, with the messages being relayed to the consultant’s mailbox at the corporate office. 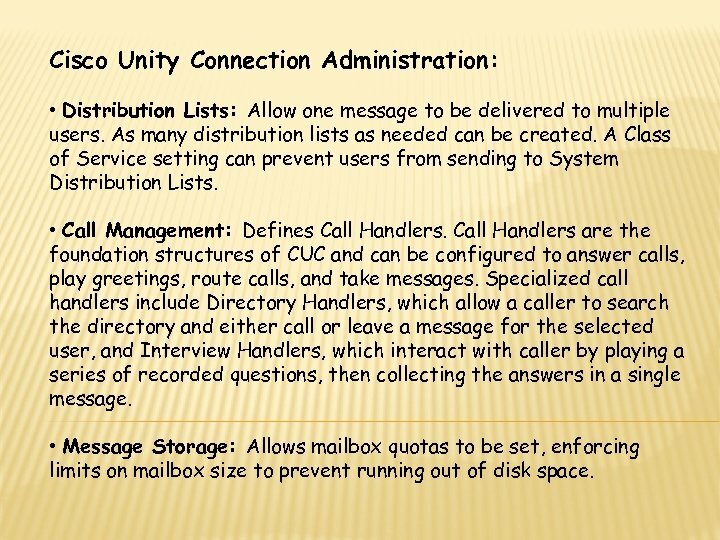 Cisco Unity Connection Administration: • Distribution Lists: Allow one message to be delivered to multiple users. As many distribution lists as needed can be created. A Class of Service setting can prevent users from sending to System Distribution Lists. 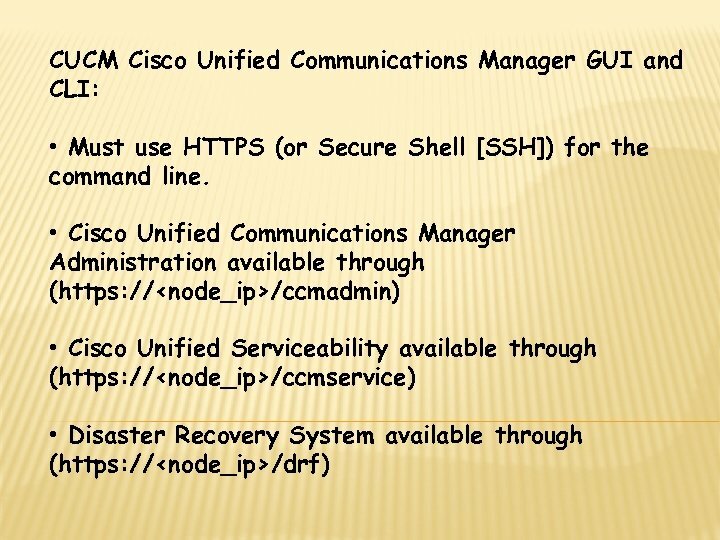 • Call Management: Defines Call Handlers are the foundation structures of CUC and can be configured to answer calls, play greetings, route calls, and take messages. Specialized call handlers include Directory Handlers, which allow a caller to search the directory and either call or leave a message for the selected user, and Interview Handlers, which interact with caller by playing a series of recorded questions, then collecting the answers in a single message. • Message Storage: Allows mailbox quotas to be set, enforcing limits on mailbox size to prevent running out of disk space. 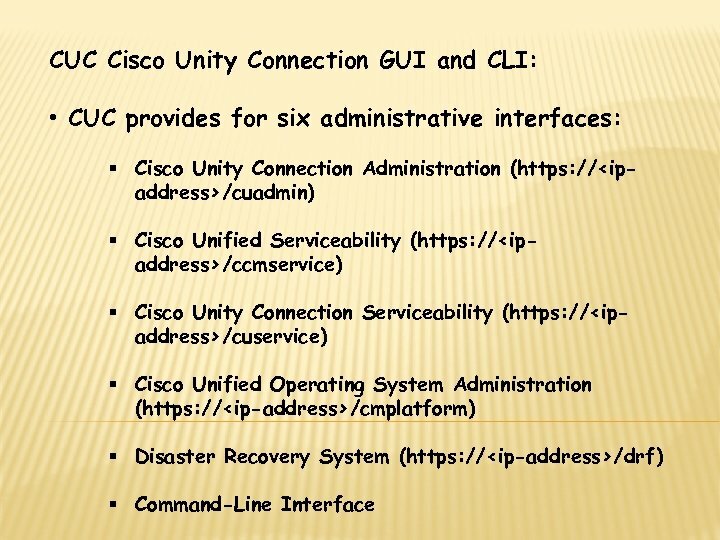 Cisco Unity Connection Administration: • Networking: Configures multiple CUC systems in either a Digital Networking or VPIM environment. • Dial-Plan: Provides for the creation of additional Partitions and Search Spaces to control visibility and access to messaging components. It is useful to “hide” part of the CUC system from certain users or functions. 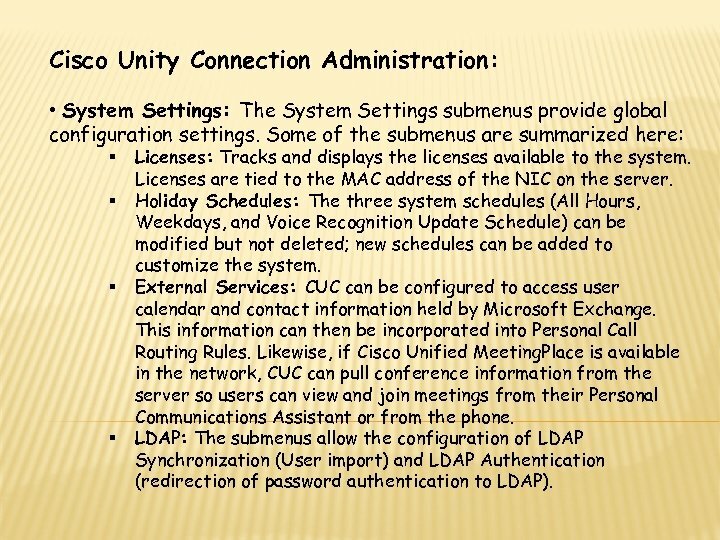 Cisco Unity Connection Administration: • System Settings: The System Settings submenus provide global configuration settings. Some of the submenus are summarized here: § § Licenses: Tracks and displays the licenses available to the system. Licenses are tied to the MAC address of the NIC on the server. Holiday Schedules: The three system schedules (All Hours, Weekdays, and Voice Recognition Update Schedule) can be modified but not deleted; new schedules can be added to customize the system. 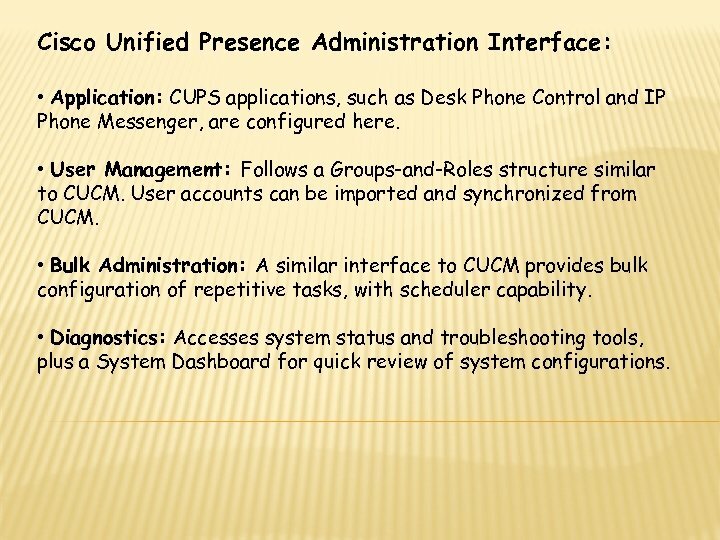 External Services: CUC can be configured to access user calendar and contact information held by Microsoft Exchange. This information can then be incorporated into Personal Call Routing Rules. 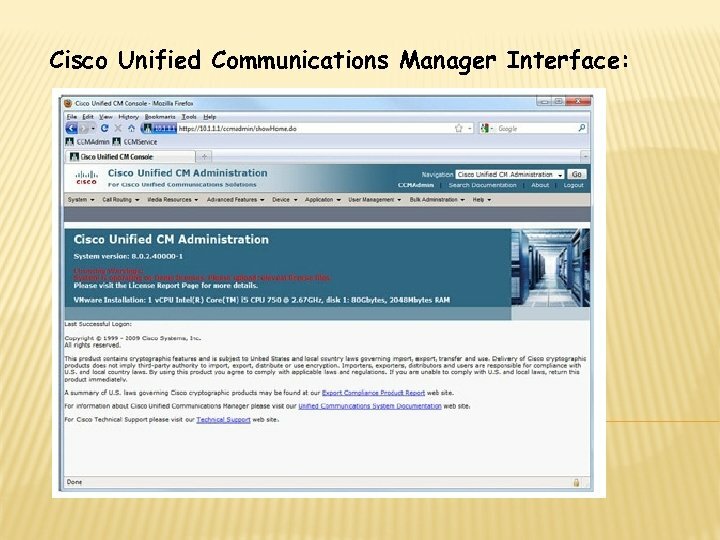 Likewise, if Cisco Unified Meeting. Place is available in the network, CUC can pull conference information from the server so users can view and join meetings from their Personal Communications Assistant or from the phone. LDAP: The submenus allow the configuration of LDAP Synchronization (User import) and LDAP Authentication (redirection of password authentication to LDAP). 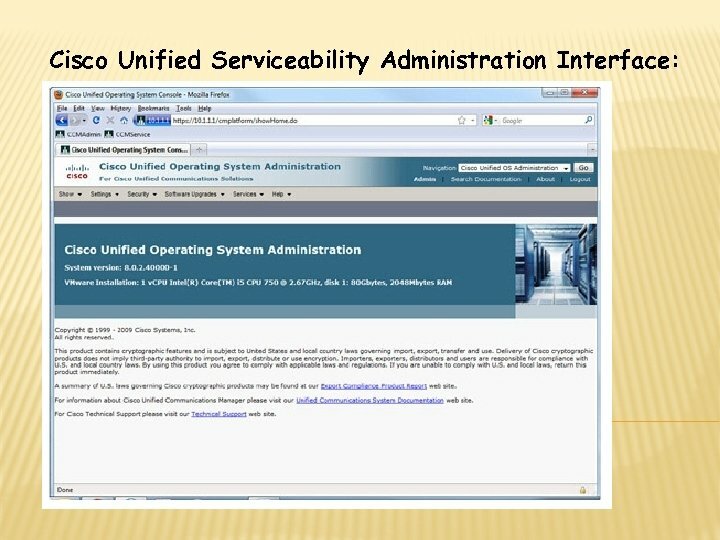 Cisco Unity Connection Administration: • System Settings: The System Settings submenus provide global configuration settings. Some of the submenus are summarized here: § SMTP: CUC can notify users of new messages via e-mail; the submenus configure details for the integral SMTP server. 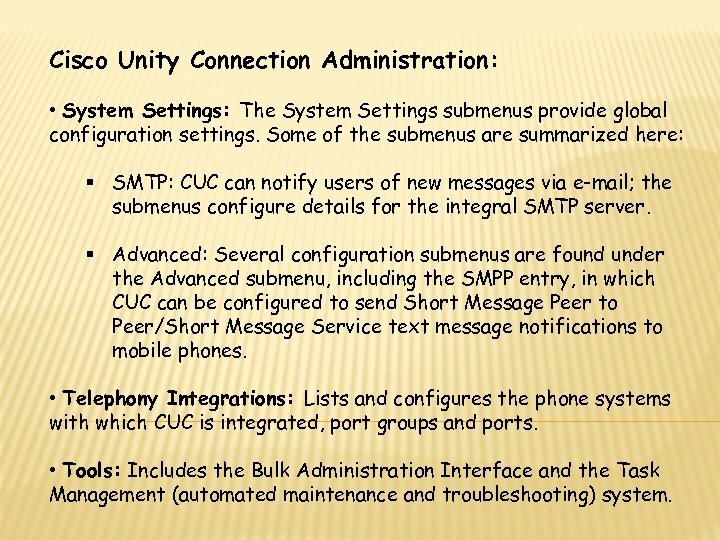 § Advanced: Several configuration submenus are found under the Advanced submenu, including the SMPP entry, in which CUC can be configured to send Short Message Peer to Peer/Short Message Service text message notifications to mobile phones. • Telephony Integrations: Lists and configures the phone systems with which CUC is integrated, port groups and ports. • Tools: Includes the Bulk Administration Interface and the Task Management (automated maintenance and troubleshooting) system. 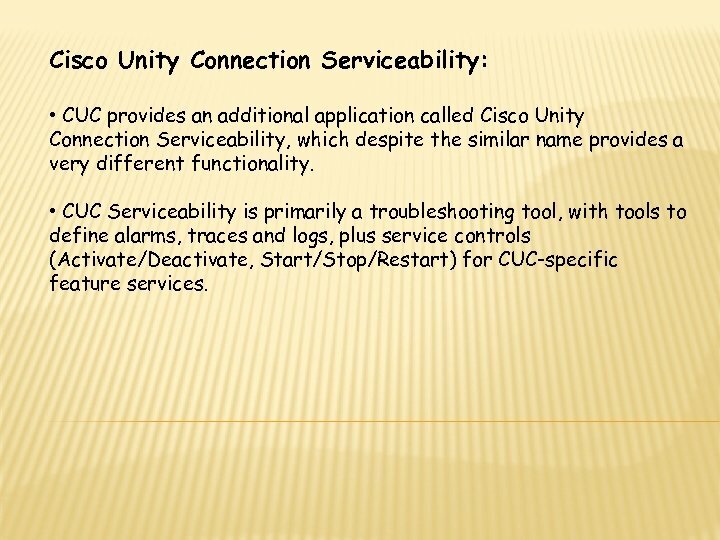 Cisco Unity Connection Serviceability: • CUC provides an additional application called Cisco Unity Connection Serviceability, which despite the similar name provides a very different functionality. 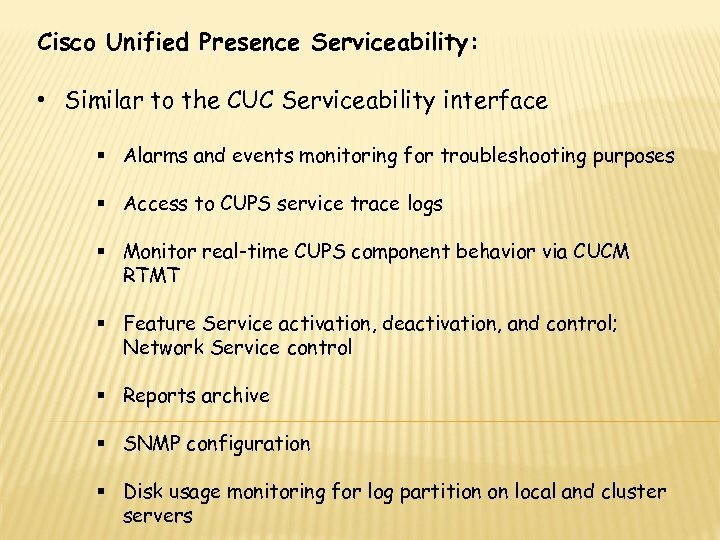 • CUC Serviceability is primarily a troubleshooting tool, with tools to define alarms, traces and logs, plus service controls (Activate/Deactivate, Start/Stop/Restart) for CUC-specific feature services. 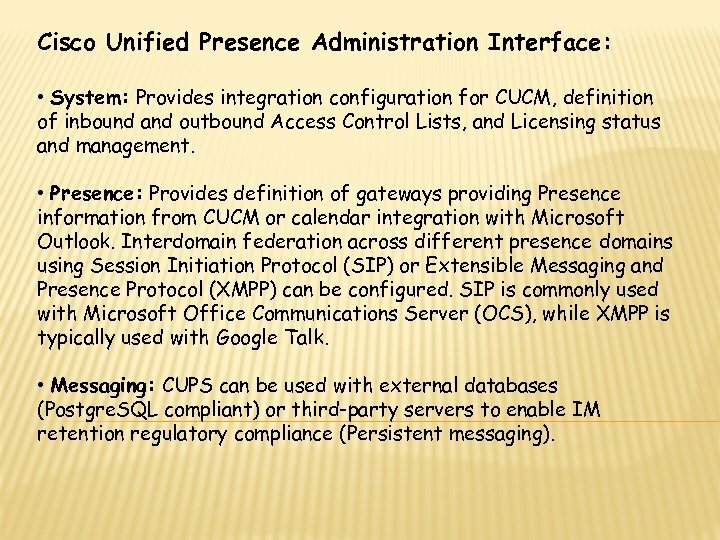 Cisco Unified Presence Administration Interface: • System: Provides integration configuration for CUCM, definition of inbound and outbound Access Control Lists, and Licensing status and management. • Presence: Provides definition of gateways providing Presence information from CUCM or calendar integration with Microsoft Outlook. Interdomain federation across different presence domains using Session Initiation Protocol (SIP) or Extensible Messaging and Presence Protocol (XMPP) can be configured. SIP is commonly used with Microsoft Office Communications Server (OCS), while XMPP is typically used with Google Talk. • Messaging: CUPS can be used with external databases (Postgre. SQL compliant) or third-party servers to enable IM retention regulatory compliance (Persistent messaging). 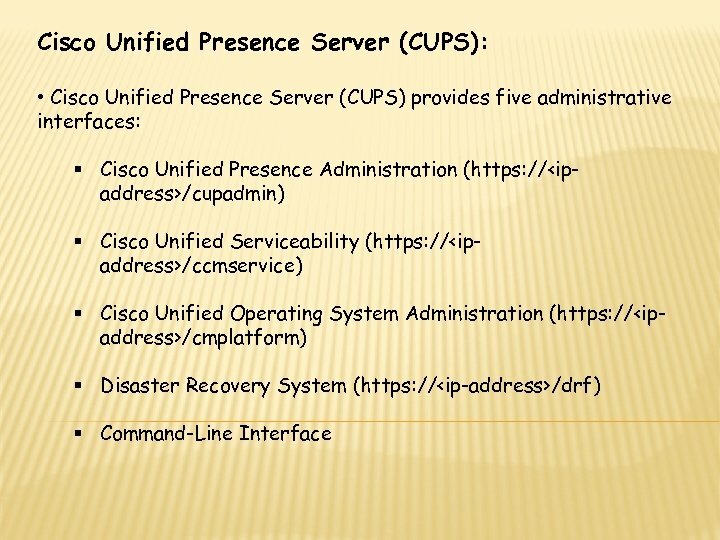 Cisco Unified Presence Administration Interface: • Application: CUPS applications, such as Desk Phone Control and IP Phone Messenger, are configured here. 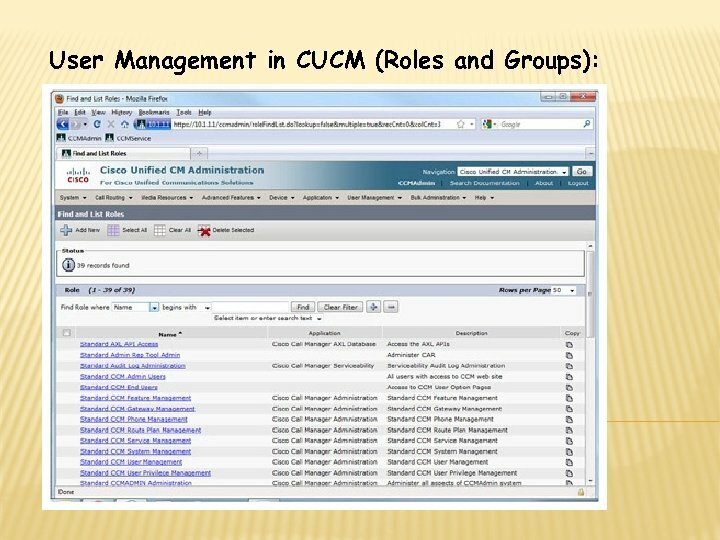 • User Management: Follows a Groups-and-Roles structure similar to CUCM. 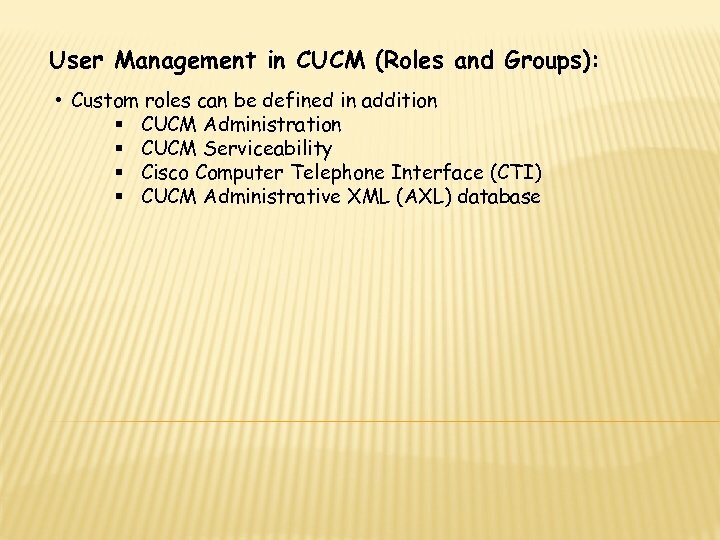 User accounts can be imported and synchronized from CUCM. • Bulk Administration: A similar interface to CUCM provides bulk configuration of repetitive tasks, with scheduler capability. • Diagnostics: Accesses system status and troubleshooting tools, plus a System Dashboard for quick review of system configurations.